The Crosby Building was one of the few in the survey that achieved the trifecta of being eligible for listing at the local, state, and national levels. Former Bing Crosby Enterprises (BCE) Engineer Robert Phillips prepared and submitted a nomination package replete with documentation that underscores that the Crosby Building meets the criteria for a favorable recommendation to be forwarded to the National Register. 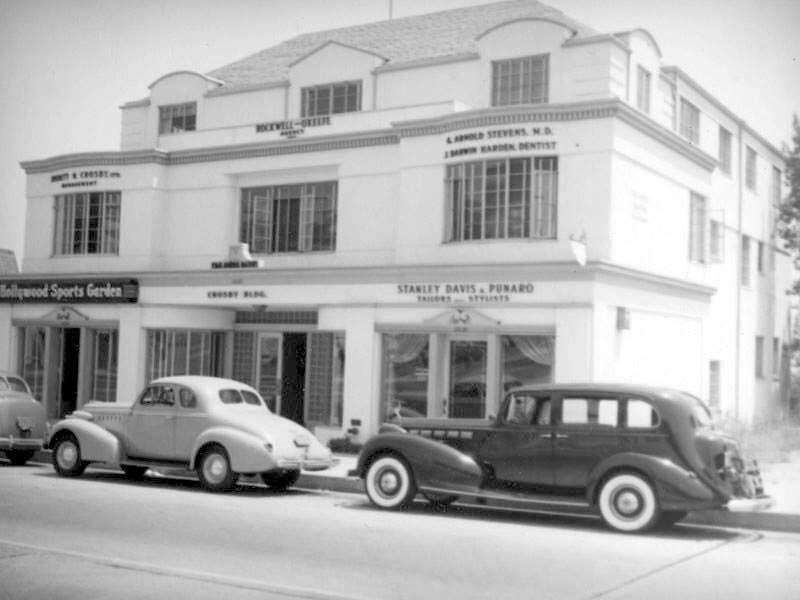 As one of the few commercial buildings remaining on Sunset Boulevard from the late 1920s and 1930s, the Crosby Building retains excellent architectural integrity, still appearing as it did when first built in 1937 in the Colonial Revival style with Moderne elements. Particularly striking are the setback of the building’s floors, the original steel, multi-light casement windows, and the three separate storefronts along the front. In fact, these storefronts are remarkable because they have not been altered over the decades in any way to suit the fashion of the times. The building was designed by architect Ronald J. Webb and constructed by C.R. Sentney as the commercial base for BCE and Bing Crosby, who many recognize as the consummate crooner, radio personality, and Paramount Pictures star. But in forming Bing Crosby Enterprises and basing it at 9028 Sunset Boulevard, Crosby’s reach grew to involve a variety of businesses, including electronics. It is within the walls of the Crosby Building that the first practical video recorder was built so that Crosby could record his show on magnetic videotape (instead of appearing live during TV’s early days). Also, the research and development laboratory at BCE yielded other inventions that aided the U.S. and its allies to ultimately be victorious in World War II. For its association with the history of commercial development in West Hollywood, for its place in shaping world history with the first practical video recorder and other inventions, for its association with world-famous entertainment personality and businessman Bing Crosby, and for its distinctive architectural style that still retains its integrity after over 80 years, the Crosby Building in West Hollywood certainly meets the high standards needed for listing at the State and National Levels. Thank you for your work on behalf of historic preservation.